Published on 29 December 2012. 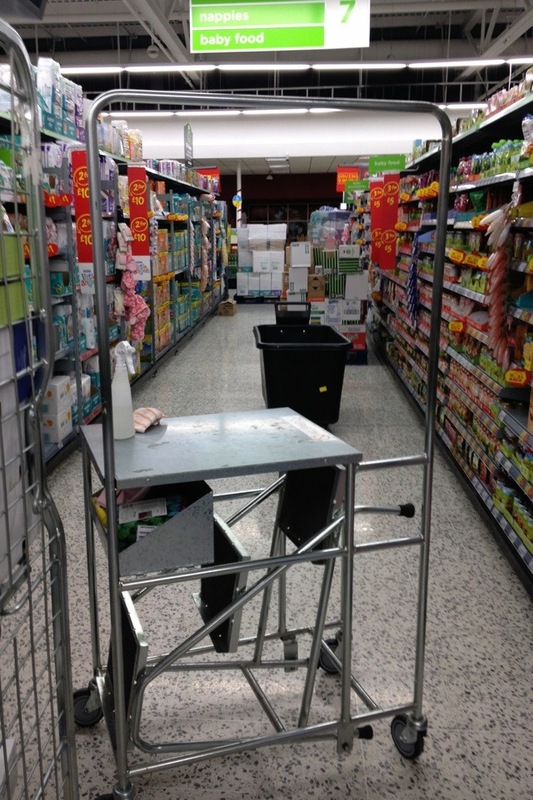 I surely can’t be the only person who finds it irritating when supermarkets decide to turn themselves into obstacle courses by bringing out every roll cage, pallet and cleaning trolley from their warehouse and abandoning them in the aisles…! It’s especially annoying when they line pallets along one side of an aisle, blocking access to all of the shelves on that side. In an apparently litigious culture, it’s a wonder these retailers aren’t sued every five minutes by shoppers tripping over the unattended cardboard boxes that are frequently found littering the aisles. This 1,949th post was filed under: Photo-a-day 2012, Asda, Retail.